it stresses me out to the max so I tried to avoid it as much as I can..
but in all reality it doesn't help by ignoring all the issues that come up..
My camera or lenses have been having focusing issues since August. I sent it into Nikon, got it back and I still have the issues..
that will ultimately never be fixed. that was jammed almost two years ago that I never wanted to fork out the money to fix..
but after talking to the camera shop they recommended that being my first thing to fix. I have no fix for anything in the picture taking department! Just working with not so great camera equipment in the mean time. blogger.. my photos no longer upload in great quality, they are distorted and blurred? I've googled trying to fix it even going to my picassa account which I think is linked to blogger and I have not found an answer for why this is happening?! So in the mean time I have resorted back to uploading through photobucket.. which is way more time consuming. this results in me only being able to edit a couple images at a time..
then scrounging up things to delete or things to move over on a jump drive. If you have ever tried to work on laptops or desktops with no hard drive space..
it is quite possibly the most frustrating and time consuming process. The computer literally crawls and goes at the slowest pace ever! so that transitions into my external hard drive issue. See, this is what I have done in the past.. when my computer or laptop gets full.. I start moving folder and files over to my external hard drive. Well, three-four months or so ago my hard drive died on me. It just keeps making this beeping sound at me when it is plugged in. I have googled everything and haven't found anything to work..
in hopes that, that is where the problem was..
but it arrived on Saturday and that is in deed not where the issue lies..
so I am still not able to access 7+ years of our life in pictures/files! SERIOUSLY?! this is like a nightmare. Zoey's birthday pictures were not transferred over.. I was only able to take off and edit a few of my favorites..
so I could swap things out and free up space on my hard drive. SO to make things worse.. in the mean time. was somehow inserted into my laptop by the wrong end..
Now I'm assuming I somehow managed to do this..
the only thing I can think of is that I was working on the computer late at night and swapping out sd cards in the slot and it was bedtime so the lights were off already..
and I somehow managed to not notice.. I can't remember if it was the next day I noticed or when..
and noticed the other side was pretty hot -- the end that had been inserted on accident. if you are still following and haven't completely gotten LOST yet.. BESIDES the fact that my computer will NOT recognize my sim card anymore..
the SD CARD is now literally smoking while it is inserted into my LAPTOP! so for those of you who have ever had SD CARD issues..
most of the time you can still save your images even if the SD Card is damaged. 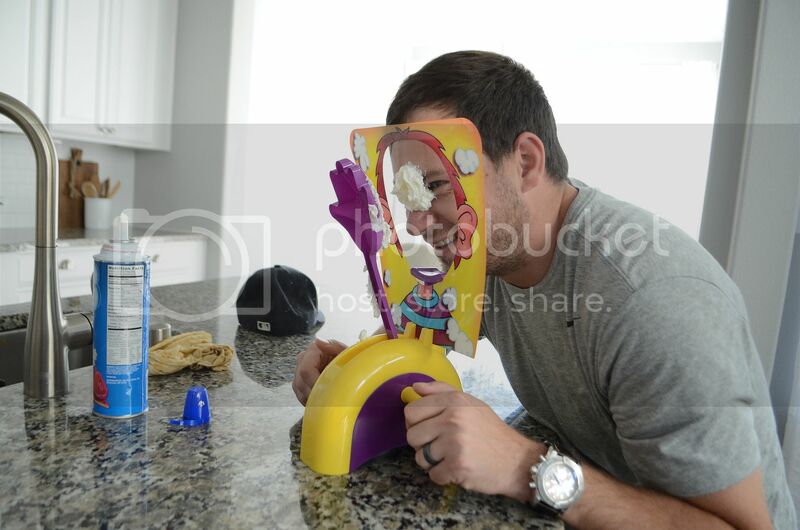 and I won't be able to have access to the rest of the images from Zoey's party!! ohhh it made/makes me so sick! IF I have to look on a bright side though.. I was able to salvage some of my favorites from the night..
by no means all of them.. but a small portion..
so at least I have something. haha and a good reason for being away for far too long on this little space here! despite all the depressing news hah! Ty was able to run errands with me one day while Lexi was in school..
which was such a treat by the way.. almost felt like we were on a date ha! 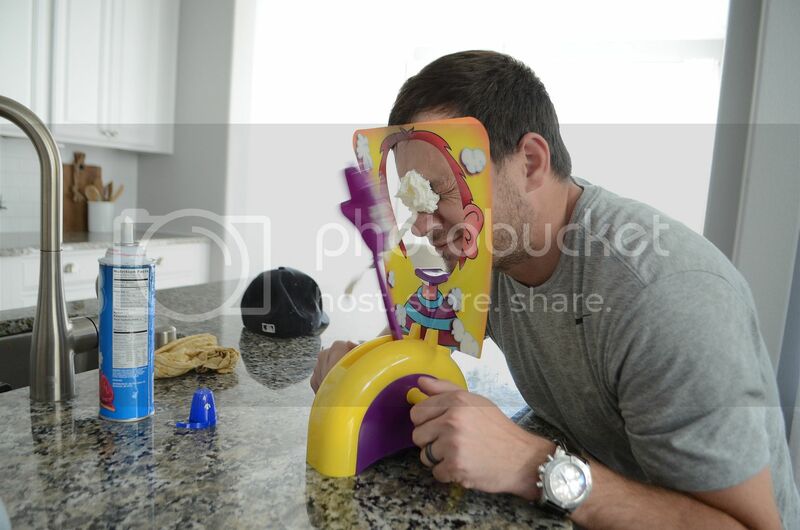 We picked up some Christmas gifts and snagged this game "Pie Face"
so we went and snagged it! and it was in deed HILARIOUS! this was Lexi's first go at the game... and it was priceless! So sorry this is such a frustration to you! With the Blogger uploading detail... are you uploading when composing and making sure to select "original size"? That will ensure the quality appears true when on the blog versus a pixelated version. You will need a code implemented on your page in this case to make sure all images resize to the same with publish and live BUT that could be your ticket! also that game looks fun.